I am a bee pathologist, retired from the Central Bee Research Institute of Khadi and Village Industries Commission as senior scientist. I want to make a few points with reference to the CSE laboratory study on honey (‘Daily dose’, September 16-30, 2010). It is necessary to feed bee colonies with medicated sugar syrup containing a very mild dose of antibiotics to control bacterial diseases. The dosage is harmless to honeybees and completely harmless to human beings. In-depth research has been conducted in different countries to prove this. Traces, if found at all in some honey samples, are not alarming. Of course, we should take optimum care to avoid contamination of honey but we should not do anything at the cost of bee health, otherwise we will not only lose honey supply, but also the service bees provide in enhancing crop output by acting as pollinators. Another green revolution depends on the valuable role of honeybees in agriculture neglected by the department of agriculture. Agmark certification and other regulations are in place to ensure purity of honey. Bee keeping in India is still in its infancy and the media should play a positive role in promoting the industry. It is worrying that Indian companies are adopting double standards to market honey. They export quality honey and sell substandard honey domestically. This is hurting our own people. The honey exporters are behaving the same way as multinational corporations that were selling soft drinks containing pesticides. That too was exposed by CSE. The editorial, ‘The battle for control of our bodies’ and related stories on commerce in honey (September 16-30, 2010) would help consumers make an informed choice. Indian consumers treat certain items as not susceptible to contamination; honey is one of them. The articles shatter this myth. The government should strictly regulate the quality of food products to save the health of the nation. We are governed by people who care only about their monetary gains. Introducing foreign bee species to augment yields, without thinking about their health effects, reminds us of similar experiments in other food items, vegetables, oils and milk. This happens frequently because of people’s ignorance. An awareness drive should be initiated to educate consumers. Markets have been inundated with food products steeped in toxins. It becomes a challenge to select products when you go for grocery shopping. CSE’s recent study on honey has made me more conscious of my decisions. But I feel that CSE’s findings should be disseminated aggressively. Besides print and web media, schools and colleges should also be targeted. I would like to see the Pollution Monitoring Laboratory of CSE investigating products for any adulteration brought to notice by consumers. Private food testing laboratories undertake testing only for companies and organisations. The article ‘Why do judges need to be sensitised?’ (August 1-15, 2010) appropriately expresses that industrial lobbies are influencing the understanding of judges on the intellectual property rights (IPR) laws through judicial education programmes. 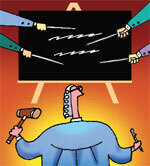 There are two approaches to the interpretation and enforcement of IPR laws. The first, advocated by vested corporate interests, aims to maximise profits of IPR holders. The other approach, advanced by public agencies and supported by a number of national and international judicial pronouncements, seeks a moderate interpretation of the law that would retain room for meeting social objectives, such as safeguarding the poor’s access to essential products. In the light of these competing approaches, judicial education programmes should not be sponsored by private corporate entities who are litigants before courts. Mobile towers are a wastage of space (‘Cell towers, a health risk’, September 1-15, 2010). People who live within a radius of 15 metres of these towers risk their health, according to the findings of a recent study. A small chip should be developed to receive and send signals from satellites for mobile phones to work. It shall save expenses of mobile companies and require negligible space. Our government thinks by issuing ‘dos and don’ts’ it does its bit towards tackling dengue. The public pays attention to these instructions only when someone falls ill. What is needed is that health authorities join hands with private companies to improve public health facilities. The joint effort will bring forward drastic changes required to deal with dengue and other diseases. The cover story ‘Three Steps for India’ (August 16-31, 2010) was illuminating. During the 16th summit of SAARC leaders stressed on South Asia becoming a world leader in low-carbon technology and renewable energies. In this regard, public transport system remains an area of concern. Prices of fossil fuels are skyrocketing because of our overdependence on cars. A well-knit public transport system can solve this problem. Investments in public transport should be promoted. The number of private vehicles should be reduced and, metros and monorails need to be introduced widely. Why should we wait for a law to be reformed, or for a new law (‘Reform for reform’s sake’, August 1-15, 2010)? Our government should be able to interpret the existing laws according to the changing needs of the people. We need to reform ourselves by adopting the right attitude. The editor has rightly pointed out in the editorial ‘From where our food will come’ (August 16-31, 2010) the shortage of agricultural labourers. The demand for food increases with increase in population, but the size of land and other resources remain the same. To counter this, farm inputs should be supplied at affordable costs and managed properly. Management of rainwater requires special attention by the authorities. I am an Army officer posted in the eastern Arunachal Pradesh and pained by the region’s administration’s approval of deforestation activities and wood smuggling. Manabum forest is one of the few reserved forests in the Arunachal Pradesh-Assam- Nagaland belt. Before industrial revolution, the residents of this area were unaware of tree felling. Today the situation is different. Apart from the Khamti tribe, which follows a monarchy system, all the other communities support deforestation activities. But who can be blamed? The people are not well educated to understand what they are doing. I have seen only one activist, who, with his wife and group of supporters, is protesting the crimes. The government should take immediate steps to reduce the demand for wood, which, I think, is the only way of tackling the problem. I had raised the problem of mistreating attendants at public utilities at ISBT Kashmiri Gate in Delhi in Down to Earth letter section. It seems to have been solved now. During my recent visit to the bus station, I noticed the transformed attitude of the attendants. They did not snap when someone asked them if using the urinal facility was free. But they still charged money. I think it is an awareness problem and will be solved with time and education. Natural resources are the GodÃ”Ã‡Ã–s most precious gift with which no man-made material can compete. Out of the enormous natural resources forest has a unique position in our life. From the time immemorial, forest is serving its best for our well being. Forest being the shelter for almost all the flora and fauna on Earth, nourishes them all with foods, clothing, medicines, security, comfort and peace of mind. Forest, we know, is the regulator of the day to day climate. It helps in bringing rainfall, which is the mainstay for a country with agriculture as the back bone of its economy. Besides, in the course of heavy to very heavy rainfall, forest plays a central role in preventing soil erosion. Forest Ã”Ã‡Ã´ like water Ã”Ã‡Ã´ is one of the main sources of our food. From the Pre Historic life to the present dayÃ”Ã‡Ã–s modern and civilized life, forest is continuously putting its helping hands for the fulfillment of our food. Everything, what we take in our life as food is, by anyhow, related to it. Forest also has a vital role in promoting Oxygen and Carbon Cycles. It inhales the poisonous gas, Carbon dioxide, and exhales a fresh Oxygen rich air for our survival. But, now a days, conservation of forest has become a key question. Contrary to this, the Govt.Ã”Ã‡Ã¶not being very passive Ã”Ã‡Ã´ has always been taking initiatives towards its conservation since decades. Taking from Ã”Ã‡Â£Second Five-Year PlanÃ”Ã‡Ã˜ where 18 National Parks and Wildlife Sanctuaries had been established and the Ã”Ã‡Â£Biological Diversity Bill 2000Ã”Ã‡Ã˜ where a National Biodiversity Authority had been set up to Dr. A P J Abdul KalamÃ”Ã‡Ã–s Ã”Ã‡Â£A Tree for a ChildÃ”Ã‡Ã˜ norms and a one week festival Ã”Ã‡Â£Van MahotsavaÃ”Ã‡Ã˜ celebration every year to encourage people to plant more trees, are all worth worthy. Sunder Lal BahugunaÃ”Ã‡Ã–s Ã”Ã‡Â£Chipko MovementÃ”Ã‡Ã˜ in 1972 is also unforgettable. We, on the other hand,should not at all lag behind. We should, on a regular basis, takes initiatives towards developing a Ã”Ã‡Â£green beltÃ”Ã‡Ã˜ all around. We should always be prominent in taking initiatives to develop awareness amongst the people regarding environment. Mass awareness and education programmes have always an additional advantage in developing awareness,so there should be an emphasis in celebrating programmes like the World Environment Day, Vanmahotsava, etc. which reach a mass of people. On the conclusion, we should keep this in mind that deforestation is a great social and national evil. So, let us put our hands together and make ourselves strong to build a very Ã”Ã‡Â£Green EarthÃ”Ã‡Ã˜ Ã”Ã‡Â£Green IndiaÃ”Ã‡Ã˜.